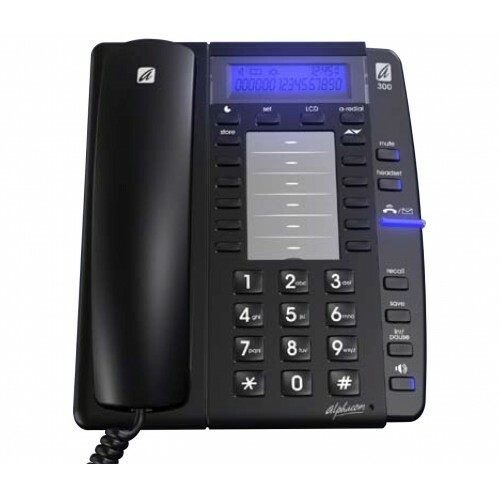 With a smooth and stylish black design that complements any modern office, the Alphacom A300 corded telephone provides a range of value­ adding features and exceptional ease of use at an affordable price. It is also backed by a lifetime warranty for extra peace of mind. The Alphacom A300 features a two-­line LCD display for showing the time, the number calling and various other status indications. You can also adjust the contrast using the buttons just beneath the screen. Other features include 20 non­-volatile memory locations for programming in your most important contacts and controls for changing the ringer volume and pitch or the volume of an optional headset. A latchable mute control is also provided for the headset and handset. Why Should You Buy this Corded Telephone? Providing versatility and value, the Alphacom A300 is the perfect phone for any business or busy home office.